Resisting the requirement on Wednesday to turn right at Barbridge Junction, Cleddau cruised on, northwards, still on the Shropshire Union. Onward then, past two charmingly named boats, Rough Grazing and Meadow Sweet. 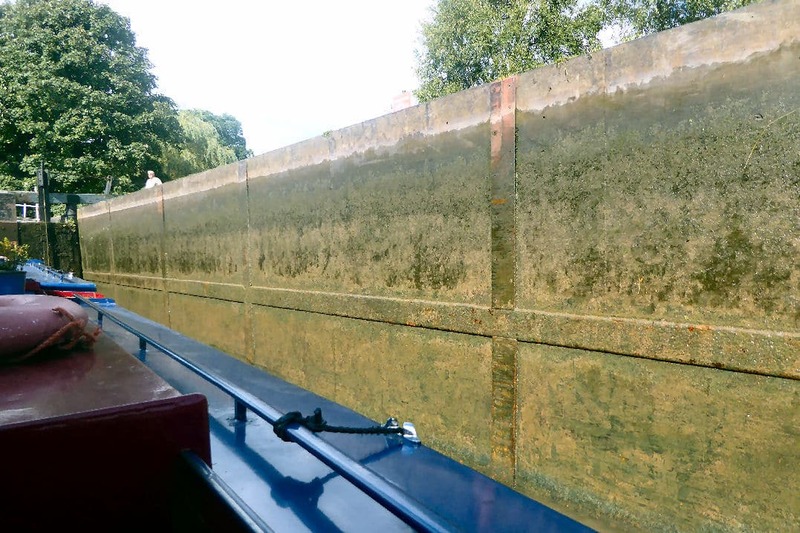 Beeston Iron Lock is a curiosity: single boat passage is advised as the protruding horizontal flanges on the iron plates could cause two boats side by side to jam. (Initially built on “running sand” the lock had collapsed but was later rebuilt by famous canal engineers William Jessop and Thomas Telford using iron as a chamber lining). and then places when unusually shaped hills appear. Then came the real visual treat, the sight of Beeston Castle, high, high up on its sandstone outcrop. This was the reason for the diversion (the first one, that is). necessary diversions from the walk route -twice – and disasters, a broken shower pump and specs lost overboard preventing the Captain’s participation). But the effort in climbing so high up to the castle was well worthwhile. You reach the Victorian ticket office – and climb the steep pathway and steps to the outer gatehouse. a group of pupils was being instructed in medieval warfare. High winds whipped around the hilltop. It was all but impossible to stand still. (How would the primary school teacher evaluate the success of her lesson plan? Her pupils were tasked with drawing the scene below. “Look, notice the railway line – and the canal,” she urged them, then as one they gasped as their papers took off, like birds on the wing). delays at Calveley Services while the Captain did a slow motion trip backwards into the bow, taking the operating hosepipe with him, drenching himself and the deck (very much a disaster at the time) – and then came news of a full-blown Delay. – and come upon a combined musical ensemble in a concert rehearsal. And how long will the watery route be blocked…? Who knows…? Miles, locks and tunnels so far covered since leaving Higher Poynton: 169 miles 6 tunnels, 110 locks. Nantwich proved a very good place to lurk while waiting for the canal to reopen! Happy days in France, by the way.